At York U, our campuses are alive with the vibrancy of Canada’s largest and most exciting city. We are a welcoming and inclusive community, and a leader in providing collaboration opportunities and tools that set our students up for success from day one. With more than 300+ student clubs and organizations, 1,000+ student-run events and a unique college system supported by staff, faculty, alumni, you’ll always find interesting things to do and great people to do them with. and offer endless career opportunities. York is pushing the boundaries of teaching through innovative delivery methods and unique learning settings. Our students receive the education they need to create big ideas that make an impact on the world. Meaningful and sometimes unexpected careers result from cross-disciplinary programming, innovative course design and diverse experiential learning opportunities. York students and graduates push limits, achieve goals and find solutions to the world’s most pressing social challenges, empowered by a strong community that opens minds. start making an impact on the world. At York, we dream big and in vivid colours. Welcome to the future of Canada’s leading university, a time of bold architecture, smart classrooms, thriving transportation hubs, and more dynamic community spaces than ever before. With over 90 buildings, 8 library branches, two athletic facilities, cinemas, studios, an indoor golf driving range and hundreds of lecture halls and classrooms, there's over 500 acres to discover and explore. 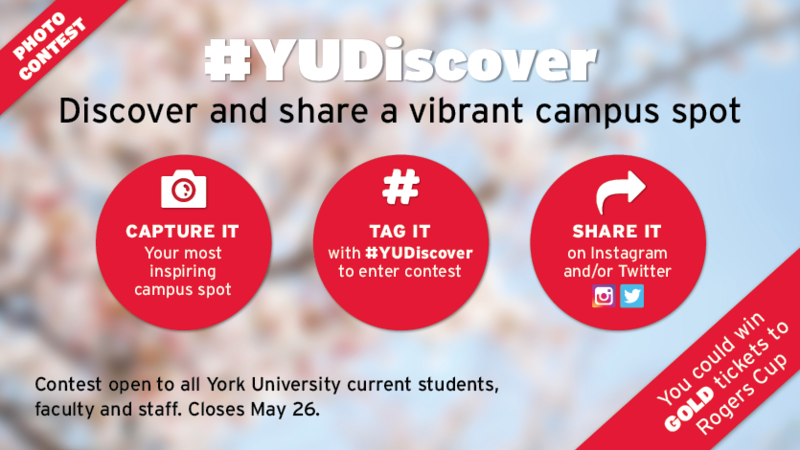 Contest open to all York University current students, faculty and staff. See full rules and details.